You might say I’ve been training for an entire year. If one were to look back on my blog posts since this time last year, accounts of numerous bicycle outings involving coffee would be found. I’ve been an active member of the Association of Caffeinated Wheelmen since the enamel pins were first made available. I followed with fascination the first three years of fall season coffeeneuring. 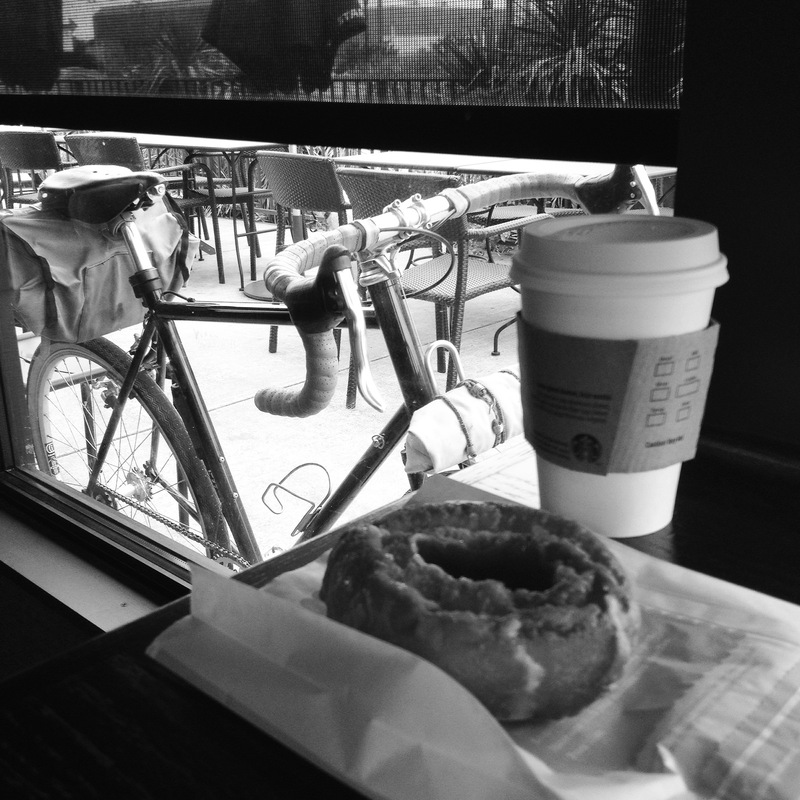 But this year will be my first attempt at coffeeneuring myself. Last year’s introduction of the “coffee shop without walls” rule was a game changer for me. I plan to take full advantage of this rule. Living in a rural area, it would be quite a time and distance challenge for me to ride to (desirable) coffee shops with walls. The photo above, taken at a Starbucks in Gainesville, Texas required a 50 mile round trip. The closest real coffee shop is about 8 miles from my house. Coincidentally, the 2014 Coffeeneuring Challenge ends the same weekend as the Sixth Annual Fall Finale Forty-ish Mile Country Path Ramble. So my guests can expect my ride on that Saturday will include a brew-up at some point along the way. This blog space will likely be filled with Ramble and Coffeeneuring Challenge updates between now and then…unless something else worth mentioning happens during my favorite time of year. And that could happen too. Pushing Steel will be available before the start of the ramble again this year. Excellent! I plan to highlight this fact in my next Ramble preparation post. Apparently, your WordPress spam filter is still at work. Perhaps it doesn’t like me filling in the “Website” box or who really knows? Anyway, I made a recent “coffee” improvement to Frankenbike myself, so that I’d be able to bring home a second cup of coffee. I think I will ride 20 miles for coffee. I see 50 is good for you.